In most cases, we suggest a lead time of at least two weeks. The turn-around time ultimately depends on the complexity of the design, the number of current orders, and various shipping factors. Please note that we always have a backlog of current orders. Of course, we understand the immediate need for such an item. God does not give us a "two weeks notice" when He restores a soul to His Kingdom. In this case, we can offer what we have in stock at that time, though selection and prices will be limited. Typically however, an immediate need takes priority in our order 'queue', and we will do our best to deliver your order as quickly as possible. For those with longer term pre-orders, we thank you for your patience and understanding! 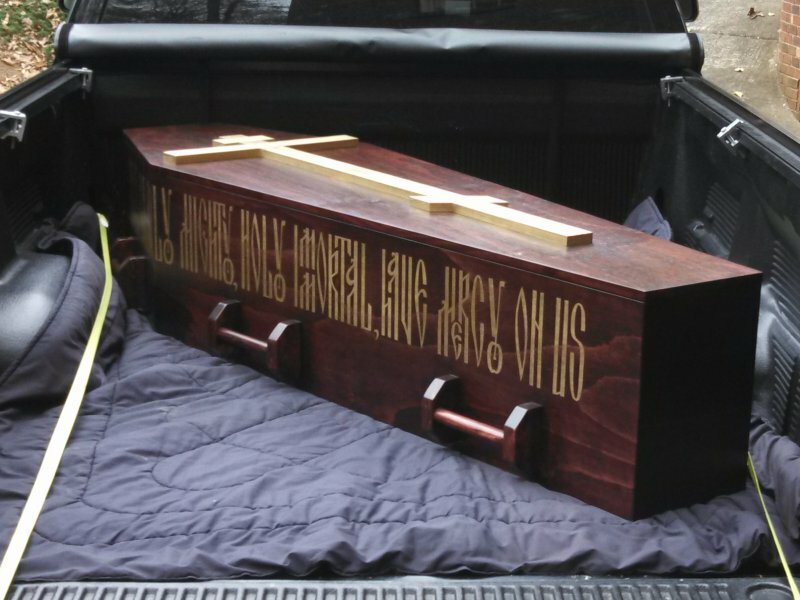 The best plan is for the church or local funeral home to have a coffin on-hand, stored in a dry place, ready for when the need arises. In this way, the church community will be prepared to fulfill its ministry to bury its brothers and sisters. This also alleviates much stress and uncertainly when a loved one leaves this world. *UPDATE. 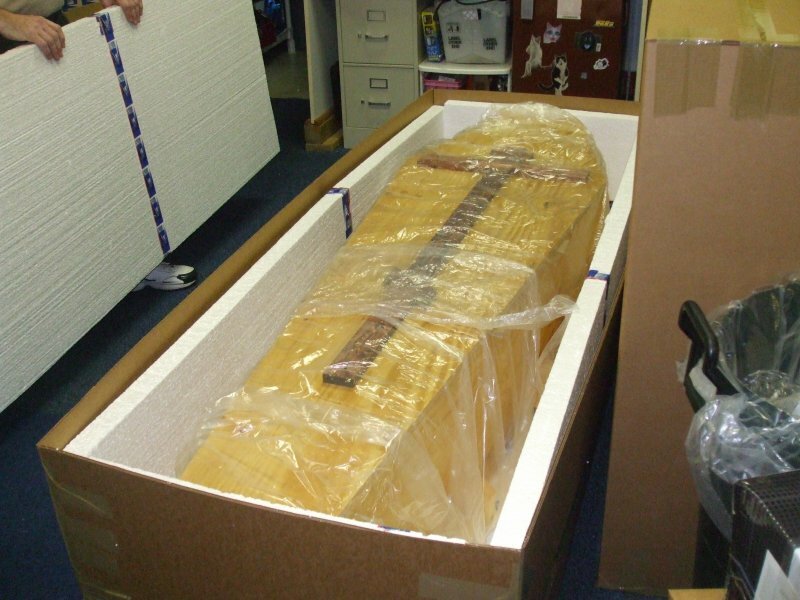 As of February 2017, standard ground shipping throughout the continental US is included in the price of the coffin. Nationwide delivery, coast to coast, is handled by standard freight shipping, and can take up to a week depending on the destination. If rush shipping is needed, we will calculate an estimate of these costs for you at the time of the order. 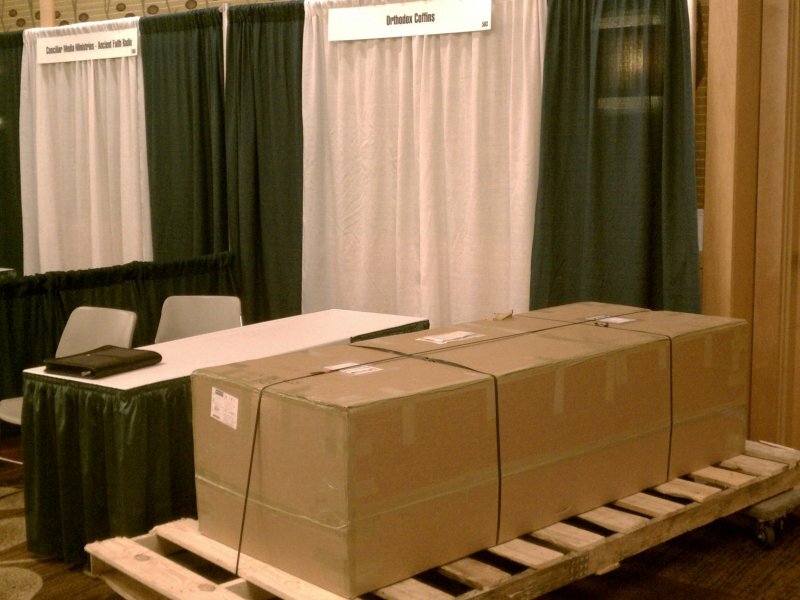 Expedited shipping costs are based on current freight shipping rates. Generally, it is best to make arrangements as early as possible. For details, call us at (336) 978-5385 or e-mail. 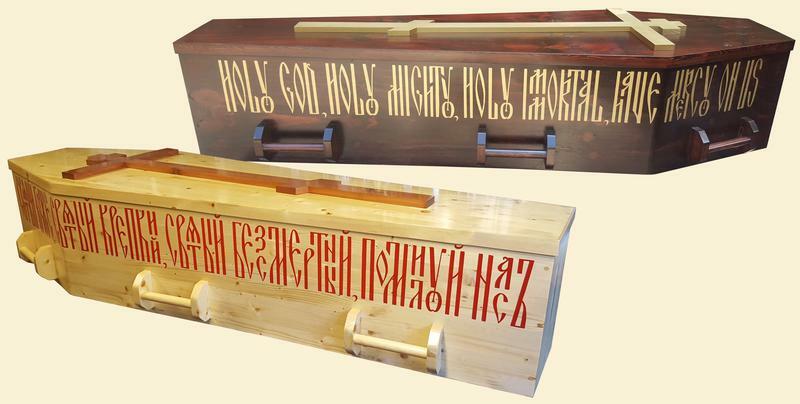 We will ship directly to a funeral home, residence or church. Please provide the name, address and phone number of the recipient. You may also have the recipient contact us to make delivery arrangements. 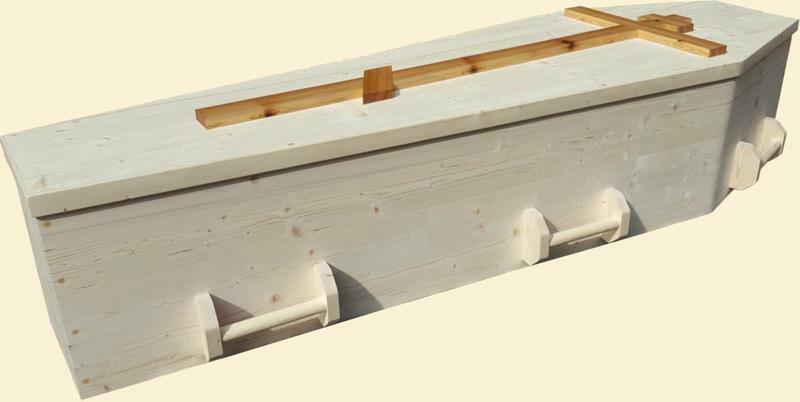 Traditional unfinished, six-sided, flat-top polygon style, six side handles and raised cross on removable lid. Interior cushioned bottom, trimmed with white plush fleece lining on all sides with pillow. Standard interior dimensions measure 6'-6½" long x 1'-10½"wide at the shoulder/chest. Depth is 12", slightly deeper at the shoulder/chest (14"), and inclined at the head. Includes stain color of your choice (typically a darker stain - red mahogany or dark walnut is recommended, but any stain color is available), and Trisagion in gold paint on both sides. Also available with Trisagion in red on a clear finish. At this time, the Trisagion is available in English, Slavonic, and Greek. Cross on lid painted gold, or stained. Satin finish. Includes all of the above and allows for different sizes, and/or any additional or unique design requests or fittings. 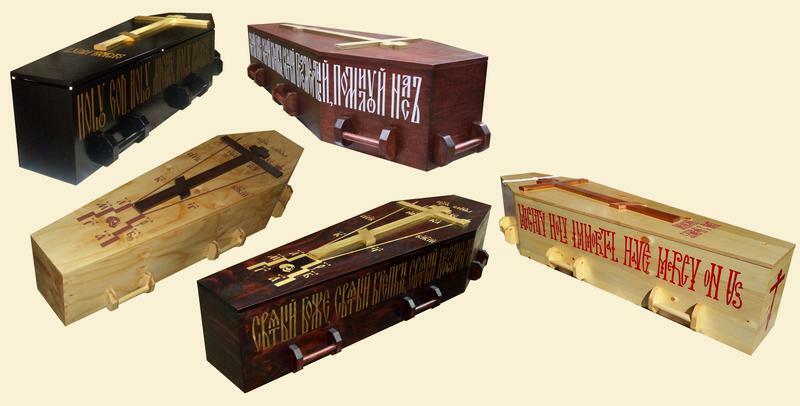 Examples may be additional handles, a cross at each end (3-bar or Byzantine), name on the lid, lids with cross on Golgotha, or other style cross. (See the Gallery page for more examples). Note: this option may take longer to produce. Call or email us to place your order, discuss shipping and delivery and terms of payment. We accept cash, checks, and credit card (add a 3.5% convenience change). We will provide the mailing address at the time of the order.